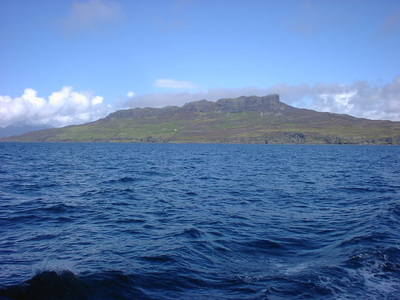 The Isle of Eigg is one the the four islands which comprise the group known as the Small Isles. 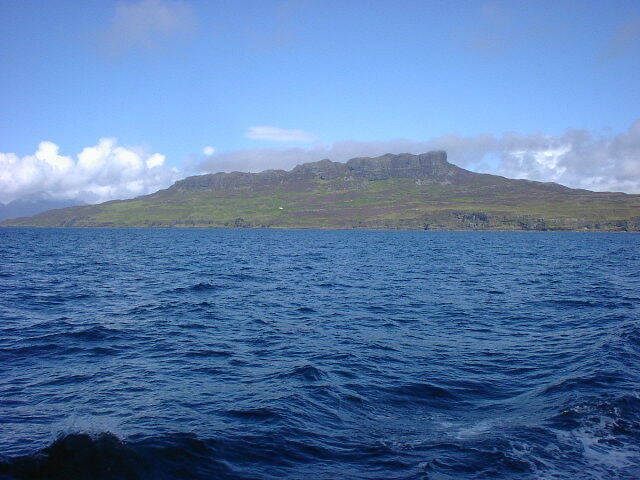 Eigg can be found 10 miles off the Scottish west coast, south of the Isle of Skye. 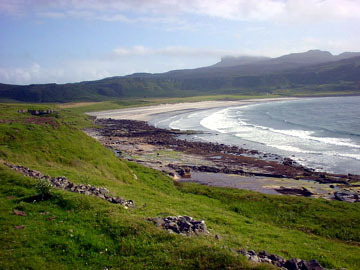 Eigg is the second largest of the small Isles but with over 60 inhabitants is actually the most populated. By the 8th century, Viking raiders were replaced by aristocratic Norse settlers who used Eigg as their base for trading with Ireland and beyond. The Norse occupation left an important legacy of place-names, not the least the name of the island itself, which comes for an old Norse word meaning notch. By medieval times, the island was in the hands of Ranald MacDonald, the founder of Clan Ranald, a descendant of Somerled, the Norse/Irish king of the Isles. Situated in the heart of Clanranald country, the island found itself involved in every MacDonald rebellion against the Crown and in a good many feuds. 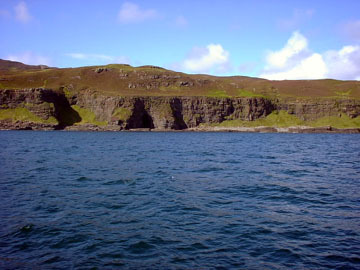 A lengthy feud between the Macdonalds and the Macleods in the 16th century led to the death of the island's entire population - almost 400 - in the Massacre Cave. The islanders paid a heavy price for supporting their chiefs in the two Jacobite rebellions. The chief of Clanranald escaped to France after finding refuge in another cave at the north end of the island at the end of the 1745 rising. The islanders who followed him were ot so lucky, they wer taken prisoners by the Navy and sent to London for trial: 19 died in prison, 18 were transported to Jamaica as slaves and only 2 came back. The island recovered some of its prosperity towrds the end of the 19th century, when its sustained a population of 500, producing potatoes, oats, black cattle and kelp. The kelp industry based on the harvesting of sea-weed financed the building of the main farmhouses on the island, tenanted by old Clanranald families, until the chiefs' policy of raising rents caused many of them to emigrate to Canada. The Clearances started as better prices were offered for land empty of people, where sheep could be pastured. The ruined villages of Grulin under the Sgurr bear testimony to that harsh period of Highland history. Fourteen families used to live there before they were forced to emigrate in 1853. Farms were divided in much smaller crofts, as in Cleadale, where each parcel of land is enclosed by walls which run from the cliffs to the sea. Old pattern of settlement still shows under these crofting boundaries. Many islanders left, unable to obtain land or work, and today, only the north end of the island remains as a crofting area. The sale of the island in the 1960's ushered a long period of instability with successive owners who did little or not enough to maintain a strong island community. By the 1980's many newcomers had joined the indigenous islanders in the task of rebuilding the community. 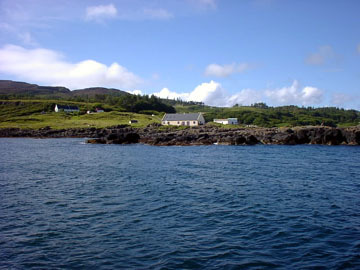 After repeated clashes with the then owner, Keith Schellenberg, who sold Eigg to Maruma, a German artist of doubtful credentials, the islanders embarked on a buy-out campaign which won the support of wildlife lovers and Scottish patriots wishing for a more just system of land distribution. The 60 million year old lava pillar at the pier commemorates the island's historic buy-out in 1997 by the islanders and their partners in the Isle of Eigg Heritage Trust. Isle Of Eigg - Excellent site packed full of the history of the island as well as plenty of local information. Good selection of photo's as well which probably make this site as close to an official Isle Of Eigg site as you'll get. Road To The Isles - Excellent site which tells you all you need to know about the "Road To The Isles". This is the road from Fort William to Mallaig. Once at the roads end the small isles ferry then takes you on to Eigg, Muck, Rum and Canna. The site has excellent photos as well as plenty of information for those looking to explore this beautiful part of Scotland. Calmac Ferries - Calmac site giving timetables & fares of sailings to the Eigg and the other small isles. Small Isles Ferry - Details of ferry used to service the small isles from the superb 'Undiscovered Scotland' site.